Brick and mortar stores have one big advantage over Internet-only shops: customers can get their goods immediately. That's why, as an answer to Internet retailing, we are seeing more and more shops selling online (where the customers are), then offering pick-up in-store (where the goods are). Even Starbucks and McDonald's have started to offer "buy online, pick-up in restaurant" options. Now, to make things even quicker and easier for customers, the large American department store Sears isn't even requiring their customers to go inside an actual store. Here's how it works: You buy online, where you include your car's make, model and license plate number. 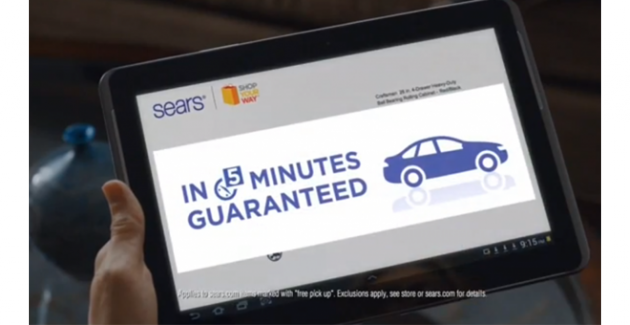 In the store's designed waiting area, you alert the shop you are there via the Sears mobile app and your purchase will be delivered to your car within five minutes.